Selenium gets its name from the Greek word "selene," which means "moon." Selene was the Greek goddess of the moon. Selenium has atomic number 34, meaning each atom has 34 protons. The element symbol of selenium is Se. Selenium was discovered in 1817 by Jöns Jakob Berzelius and Johan Gottlieb Gahn of Sweden. 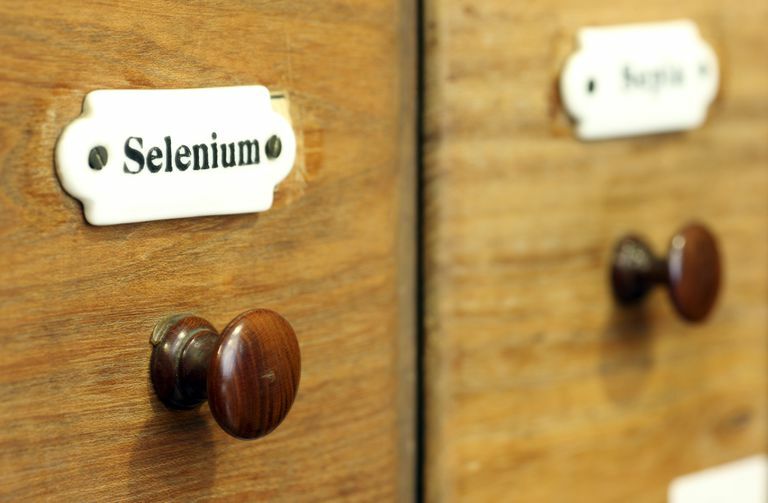 Although it is uncommonly found, selenium does exist in relatively pure form, free in nature. Selenium is a nonmetal. Like many nonmetals, it exhibits different colors and structures (allotropes) depending on the conditions. Selenium is essential for proper nutrition in many organisms, including humans and other animals, but is toxic in larger amounts and in compounds. Willoughby Smith discovered that selenium reacts to light (photoelectric effect), leading to its use as a light sensor in the 1870s. Alexander Graham Bell made a selenium-based photophone in 1879. The primary use of selenium is to decolorize glass, to color glass red, and to make the pigment China Red. Other uses are in photocells, in laser printers and photocopiers, in steels, in semiconductors, and in assorted medicinal preparations. There are six natural isotopes of selenium. One is radioactive, while the other five are stable. However, the half-life of the unstable isotope is so long that it is essentially stable. Another 23 unstable isotopes have been produced. Selenium salts are used to help control dandruff. Selenium is protective against mercury poisoning. Some plants require high levels of selenium to survive, so the presence of those plants means the soil is rich in the element. Liquid selenium exhibits extremely high surface tension. Selenium and its compounds are anti-fungal. Selenium is important to several enzymes, including antioxidant enzymes glutathione peroxidase and thioredoxin reductase and the deiodinase enzymes that convert thyroid hormones into other forms. Approximately 2,000 tons of selenium are extracted annually worldwide. Selenium is most commonly produced as a byproduct of copper refining. The element was featured in the films "Ghostbusters" and "Evolution." More detailed selenium facts are included with the periodic table data.